It's not that James Syhabout brought home Oakland's first-ever Michelin star for Commis. It's not even strictly for Commis, where each dish reveals itself to be a complex swatchbook juxtaposing subtle shades of flavor. 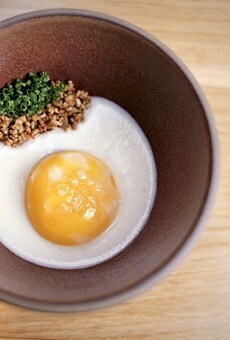 Much as we admire Syhabout's work at Commis — not to mention his discipline and quietly workmanlike demeanor, taking a pass on those fickle promises of fame chefs so often succumb to, shedding their concentration to show up at New York galas or vaunt their genius in the Twittersphere — it was an altogether humbler project that made us realize just how much we admire Syhabout. With its uncompromising palate, its fearlessness about keeping the focus small, Hawker Fare is the kind of place only a chef who's confident in his impulses and committed to his craft could think about launching. Not only that: Given that Hawker Fare references the flavors Syhabout — whose family has roots in Northeast Thailand — remembers from his mom's kitchen right here in Oakland, and that Syhabout designed the place to be a restaurant even cash-strapped kids could afford, it feels both personal and generous. Let San Francisco chefs chase after glamour. Syhabout is Oakland to the bone.